Celebrate Crafts: The Everything's ABC's blog hop letter "M"
The Everything's ABC's blog hop letter "M"
For this hop we will be featuring the letter "M". This may be the name of a paper, a stamp set or an embellishment Whatever the crafter has chosen as their "M element will be featured in their post. I am the 1st of the three blogs you will visit today! For my "M" I chose to give you all a sneak peek at 2 new products that will be available starting August 1st! My "M" item is the new Mini's stamp set! Close To My Heart has 8 of these new sets, and the are perfect for our new circle spin cards! The back round paper is from our new paper pack Frosted, and the snowflake is stamped in Whisper ink. The circle is covered with slate card stock. The snowflake has also been stamped in whisper ink on the brown paper, in "second generation" (meaning the stamp was inked, stamped onto a scrap paper then onto the back round paper). All edges were inked in Whisper. The flower in the center is from the new Base & Bling. I hope you enjoyed this card, my friend Katt helped with it. Join My August online gathering (August 1st-August 31st) for a chance to win something free from me! very elegant card! Love the spinner part! 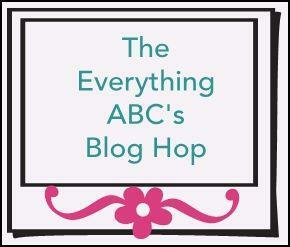 The Everything's ABC's blog hop letter "N"